Solo travel is a special adventure for free spirits. It makes for a different travel style that keeps pace with your heart. 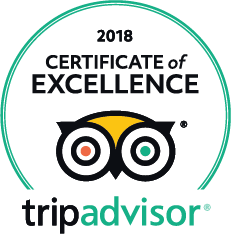 We are fiercely protective of your China journey, to make it as interesting as possible, totally secure, and truly memorable. As a pathfinder for your family or friends, we provide genuine reassurance. Without traveling companions to share the cost, such as room and meals, the budget for solo travel is higher than as part of a group. A group tour might appear to be low cost, but customers have to visit shopping stores, or else suffer a low standard of service. There are some group tours without the shopping, but their schedule is inflexible. The charge is higher, although still lower than for solo travel. Group tours without shopping are recommended, because of saving on your budget. A customized tour costs more than a group tour, but you are the master of your travel. e.g. 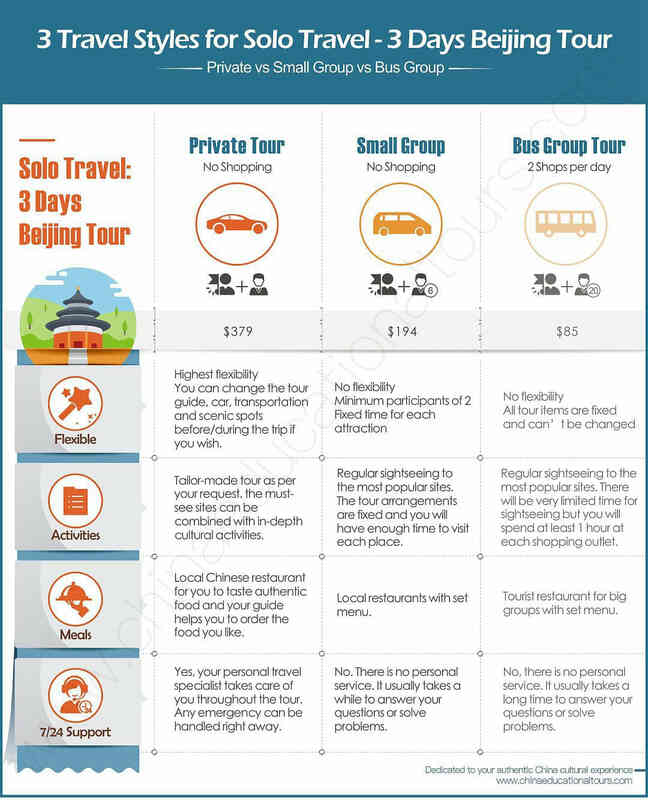 3 Travel Styles for Solo Travel- 3 Days Beijing Tour. If you can't see the inforgrahic about ‘difference between private tour and group tour’ above, this table below for your reference. Activities Tailor-made tour as per your request. the must-see sites can be combined with in-depth cultural activities. Regular sightseeing to the most popular sites. The tour arrangements are fixed and you will have enough time to visit each place. Regular sightseeing to the most popular sites. There will be very limited time for sightseeing but you will spend at least 1 hour at each shopping outlet. Meals Local Chinese restaurant for you to taste authentic food and your guide helps you to order the food you like. Local restaurants with set menu. Tourist restaurant for big groups with set menu. 7/24 Support Yes, your personal travel specialist takes care of you throughout the tour. Any emergency can be handled right away. No. There is no personal service. It usually takes a while to answer your questions or solve problems. No, there is no personal service. It usually takes a long time to answer your questions or solve problems. China is a relatively safe tourist country, and people are friendly and hospitable to visitors. But there are some tourist traps you should avoid, such as illegal cabs, worshiping at the temple, and touting of hotels and tickets. Let's create a perfect China trip for you. Our trip consultant will be in touch with you shortly. 1. Which type of tour do you prefer? 2. Where do you want to go? 3. What is your Interest? 4. When will you arrive in China? 5. How many days do you want to stay in China?